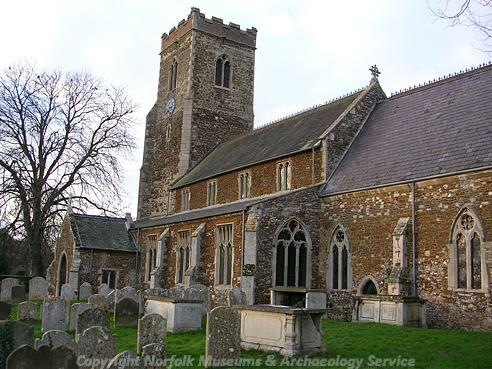 A 13th century and later parish church, with some reused Norman work, that was restored in the 19th century. The interior of the church has an arched braced roof supported on 19th century foliage corbels, a 13th century double piscina with holly foliage mouldings and a 16th century wooden alms box. In the churchyard there is a 15th century limestone cross, as well as the remains of another medieval cross recorded under NHER 3412. There are several interesting 18th and 19th century headstones in the churchyard, including one to Robert and Christine Jarred which has a relief scene of Jacob and Isaac, and several others with carved cherubs and pilasters. Much conglomerate and some reused Norman work. Present chancel late 13th century. 14th century window, chancel arch, side arches to tower, probably most of tower is of this date. 15th century arcades, clerestory, most windows, doors, porch. 19th century restorations and chancel roof. Excellent churchyard with many good headstones (several listed grade II) and cross base (in addition to reset cross site NHER 3412). Stone trough in churchyard formerly mentioned identified as from the village pump on NHER 3412. --- Newspaper Article: Lynn News. 1992. Lynn News. 21 January. --- Leaflet: A Short Guide to St Mary's Church, Middleton, Norfolk..
<S1> Unpublished document: Rose, E.. 1995. Building Report..